Jerusalem, Israel — March 7, 2015 … US President Barack Obama spoke today in Selma, Alabama. Obama marked 50 years since 600 protesters speaking out against discrimination and demanding greater freedom and security faced off with Alabama state police . The same Barack Obama used every PR asset in his office to silence Jews who arrived in Washington 4 days ago. Jews who came to protest against a terror state – Iran – which is developing a nuclear weapon. Iran which has vowed to annihilate every Jew in Israel. Obama called upon his Vice President and Secretary of State and every member of the democratic party to boycott a speech by a Jew spoken on behalf of all Jews. We are not talking about an enemy state, such as Iran which uses mock US Navy ships to fire at, but the elected Prime Minister of the most trusted ally of the US – Israel. Obama, in trying to silence and discredit the Jew from Jerusalem and a Jew who survived Auschwitz, went as far as having his national security adviser Susan Rice describe Netanyahu’s speech as “destructive” to the relationship between the United States and Israel. In a recent news poll 84 percent of Americans have described the possible Obama deal with Iran as a ‘bad idea’. The US-Israel relationship has never been stronger! Why would Obama want to silence Jews warning the world of a “bad deal” being made with Iran? Was it for the same reason that Franklin Roosevelt dismissed the Jews around him, warning him of a Holocaust in Europe? but for Jews in Washington – not. King Obama does not like to be criticized. And many think twice before saying one word in friendly disagreement with Obama. As for the Jews – the Jews of Israel who face thousands of missiles and a nuclear threat by Iran – they do and will continue to speak up. Obama cried foul. He said that Netanyahu had “breached protocol”. Netanyahu never breached protocol. In fact, Netanyahu advised the White House of his speech to Congress before the speech was given and even the New York Times admitted that there was no breach. But even if there was a breach of protocol, what is more important – protocol or nuclear weapons in the hands of Islamic terrorists? Who were these Jews who came to warn the US and the world of a second Holocaust? They came in the thousands to the AIPAC conference. 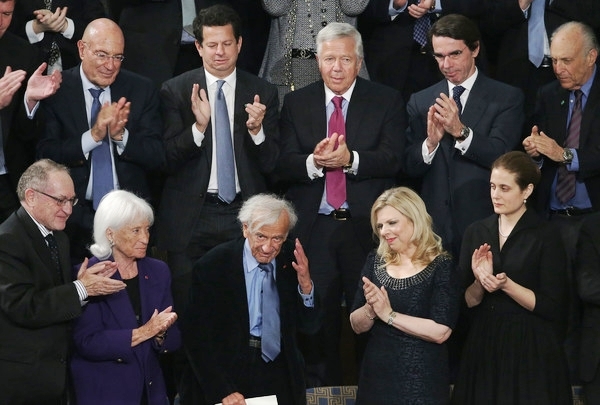 Over 16,000 Jews stood in solidarity with Israel Prime Minister Benjamin Netanyahu and Holocaust survivor and Nobel Peace prize winner Elie Wiesel. 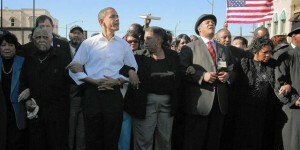 Obama was proud today to be among fellow blacks in the deep South speaking out for freedom and security. Obama should respect Israel’s Prime Minister and Elie Wiesel when they speak out for freedom and security. 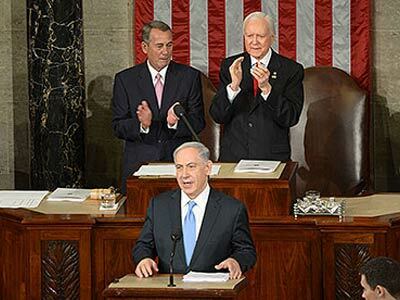 “As prime minister of Israel, I am obligated to make every effort in order to prevent Iran from achieving nuclear weapons that would be aimed at the State of Israel,” Netanyahu declared before his speech to Congress. We are not fighting against discrimination. We are fighting for our very survival. We will not be passive.